X, 256 p., 17,3 x 24,7 cm. With German contributions by Oliver Bach, Norbert Brieskorn, Frank Grunert, Ofelia Huamanchumo de la Cuba, Merio Scattola, Martin Schmeisser, Anselm Spindler, Gideon Stiening and Andreas Wagner. The lecture ›De Indis‹ Francisco de Vitoria held in 1539 in Salamanca had an enormous impact on colonial history. It also influenced the concepts of theology during the discovery of the New World as well as both legal and political philosophy. The lecture is regarded as one of the first treatises of the Conquista among early modern thinkers. This volume places the Relectio into the context of travel literature, theology of baptism and political history. Furthermore, ›De Indis‹ is correlated with the philosophy of Thomas Aquinas. 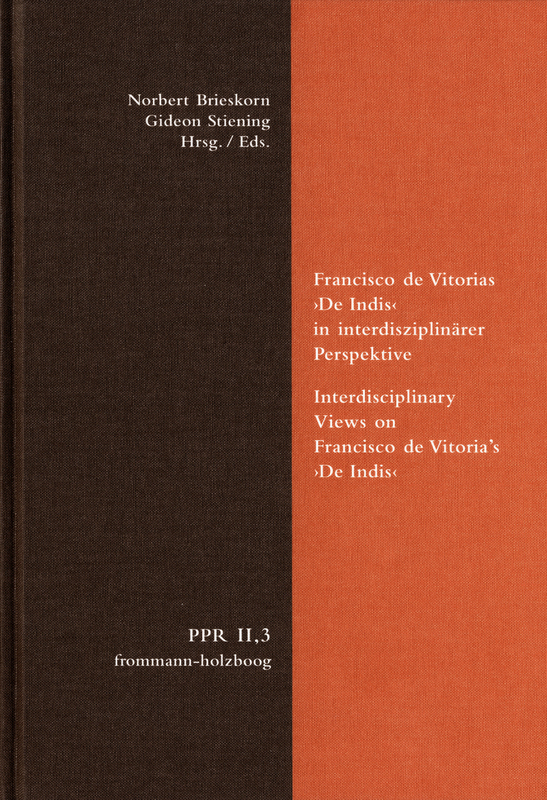 The authors also examine whether Vitorias arguments should be considered as political theology or political philosophy. Finally, the volume provides insight into objections bycontemporary critics’, e.g. those of Luis de Molina and Bartolomé de Las Casas.